Any thing that includes the stampings or other identifying marks would [probably be useful for the archives. As for the backing plates, the plates on my D44 held the bearings and seals in place. Remove the plates and the axles can be pulled out with the bearings intact. Last edited by skinny z; 03-08-2018 at 08:03 PM. 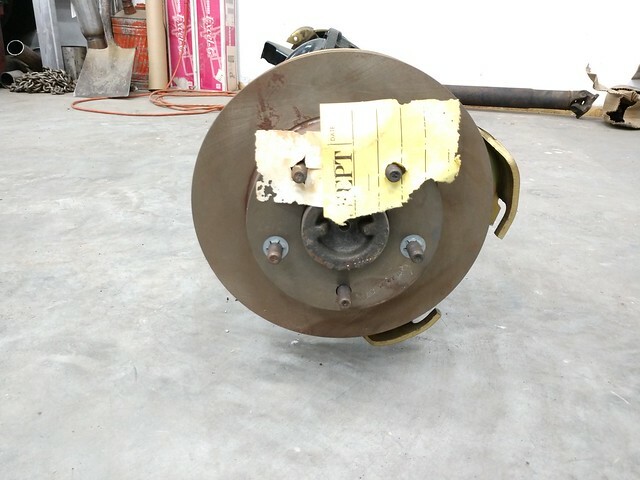 Mine appears to have a bearing/seal retainer plate followed by the disc brake backing plate to the outside. Doesn't look to be any way to get the backing plate off without removing the bearings or slotting/cutting the backing plate. In this case, the disc "backing plate" fits around the axle tube end. There is a shoulder built into the tube end which is concentric to the caliper support (backing plate). The 4 bolts then went through the retainer, the backing plate and then the flange on the axle tube end. The axle is assembled with the seals, then bearings and lastly the locking rings pressed on the axle. The backing plate goes onto the axle last and then the whole assembly is placed into the axle tube. 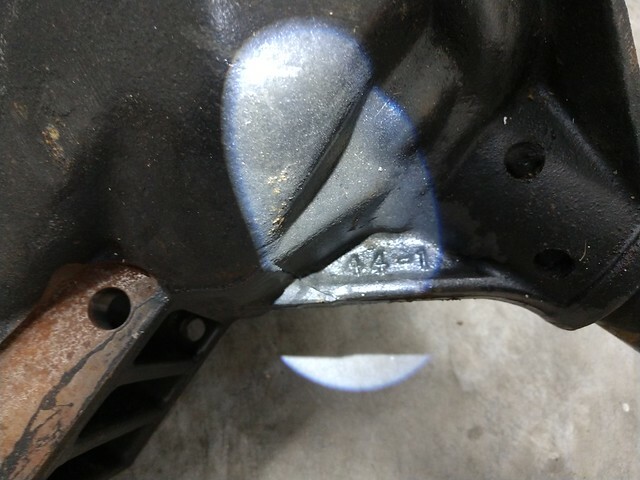 You can see the caliper support in this picture. It goes on first. Then the assembled axle (with lock ring, bearing and seal) slides into the tube. Then the whole thing is bolted together. 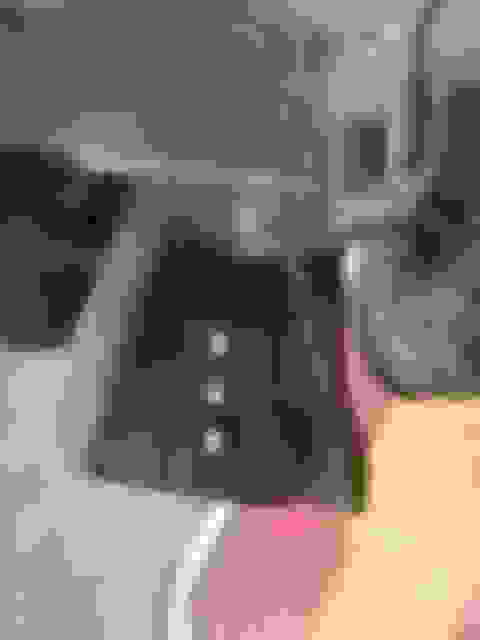 Last edited by skinny z; 03-05-2018 at 09:16 PM. Sounds backwards...My backing plate needs the shoulder on the axle tube to register properly. I can't see it working in reverse. In this case, the disc "backing plate" fit around the axle tube end. There is a shoulder built into the the tube end which is concentric to the caliper support (backing plate). The 4 bolts then went through the retainer, the backing plate and then the flange on the axle tube end. 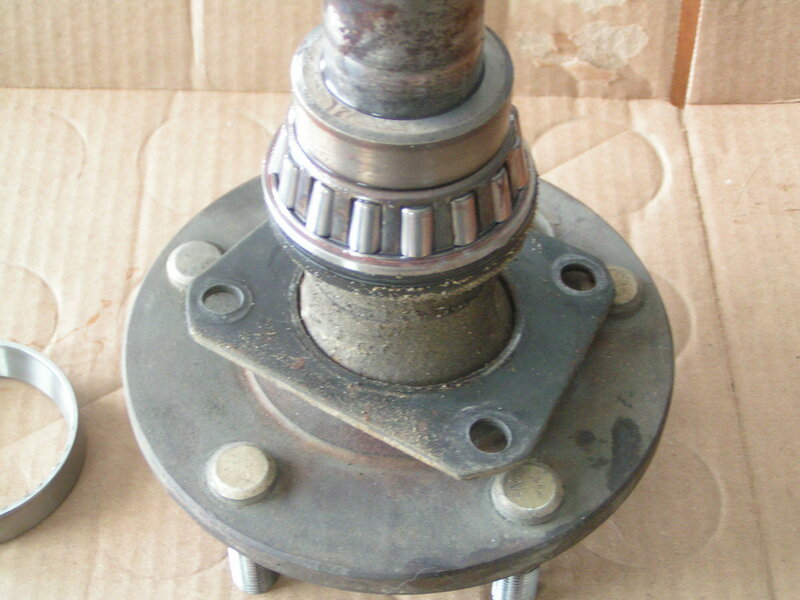 The axle are assembled with the seals, then bearings and lastly the locking rings pressed on the axle. The backing goes onto the axle last and then the whole assembly is placed into the axle tube. Good to know. I'll know more tomorrow when I get it unboxed and pull a rotor. Looked like it had an extra retainer, but I've been wrong before! One last question tonight. Is there an inner seal in the tube? 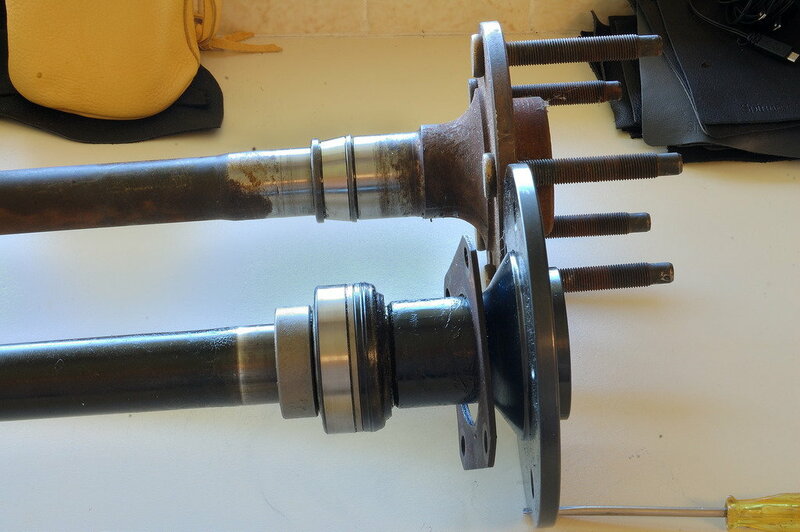 Or are these an "oil bath" type axle bearing? I imagine the 20 year old grease that was packed in these is less than awesome. 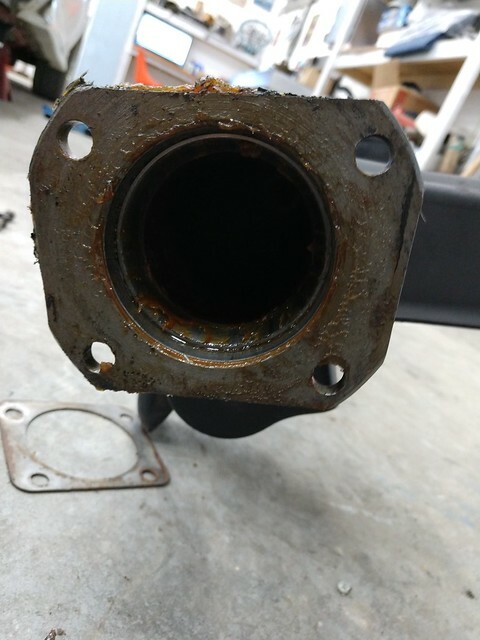 One seal mounted outboard and held tight to the bearing with the retaining plate. You can just see the seal on the bottom side of the bearing in the previously posted picture. 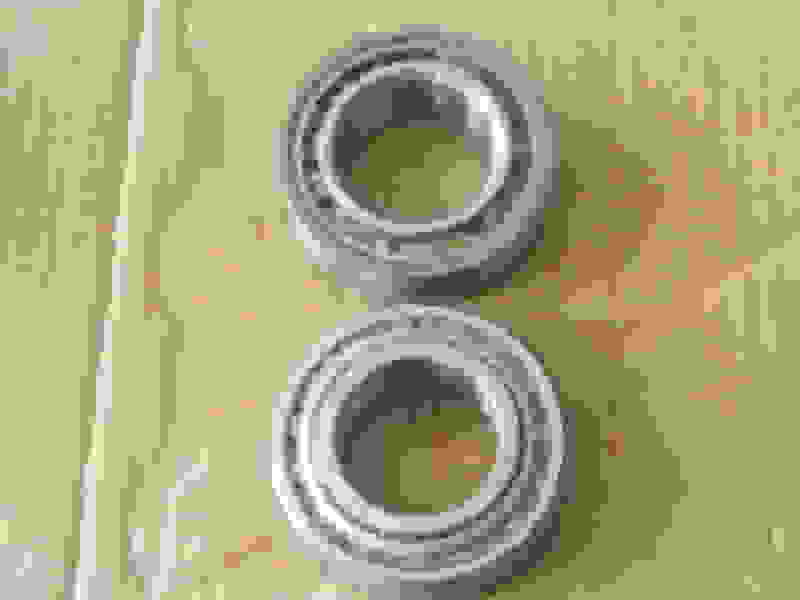 Below is the bearing itself. 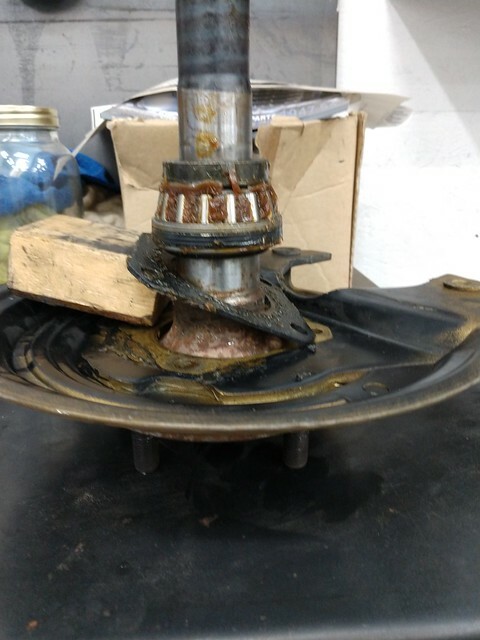 Yes, it relies on the lube in the axle housing. The backing plate (not shown) can be fitted (loosely) to the end of the axle tube. Then this whole assembly (pictured) is slide into the housing and bolted together. Last edited by skinny z; 03-05-2018 at 10:01 PM. Thank you(no sarcasm, genuine appreciation for fielding my question), yes I understand the outboard seal. In my 4x4 days I seemed to remember some Dana's having a seal just inboard from the lock ring. Wasn't sure if these were similar or not. Interesting you should mention 4 x 4. I found that a shop that specialized in that niche were best suited to handling my rebuild. I failed twice to get a unit put together that was quiet and/or lasted (and we had built a lot of drag racing 9" and 12 bolts). Took a couple of gear sets for the shop to figure that out too. Seems Yukon has a handle of parts for these pieces. Looking forward to your pictures and progress. I'm pretty sure I had that backwards (but clarified in a following post). IIRC, in order of assembly onto/into the axle housing are: the disc brake backing plates, followed by the fully assembled axle which has, in order or installation: the square 4-hole retaining plate, the bearing assembly and finally the locking ring that's pressed onto the axle (as shown in the previous picture). The reason I recall the brake backing plates being independent of the axle was that I inadvertently installed one of the plates backwards, (as in the outboard face to the inside) but was able to remove the axle, flip the plate around and reinstall the axle without having to press or cut anything off. Looking forward to what you've come across. Here are some pictures. Hoping to pull the 8.8 today and strip the backing plates off of it. The axle does have a light coat of gloss or semi-gloss black on it. The manual that came with it is identical to what has been posted before. Not much in the way of markings other than the 44-1 on the front driver's side of the pumpkin. That looks to be set up for the Delco Moraine discs. Something you'll change? 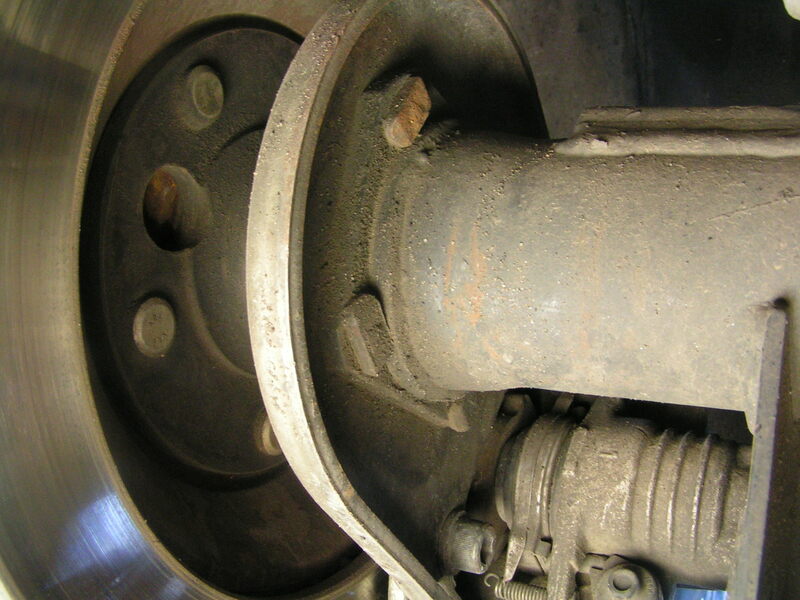 Have you determined whether you can pull out the axle and not have to deal with the caliper mounts (backing plates)? Yes, that is why I was asking the questions earlier in the thread. If I can truly mount the PBR backing plate on the inboard side of the bearing retainer plate, I will gladly slot the Delco Moraine plates to remove them. This will save the GM supplied bearings, seals, and my time. Only down side I see is the extra 1/4" gap between the seal and the bearing retainer. 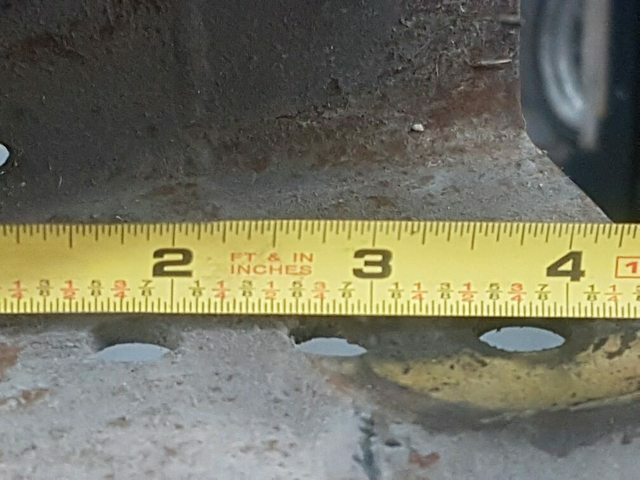 So after further deliberation...all of the pictures I can come across show the PBR caliper in the same location as the current Delco Moraine, outboard of the axle/seal/bearing retainer. I'll just have to bite the bullet and replace the seals/bearings/lock rings. I was hoping to have the car ready for next weekend, that may not be the case. I'm certain that my caliper mounts (there is no backing plate) fit around the shoulder on the end of the axle tube. That said, this means the inner bearing race bottoms out in the axle tube. 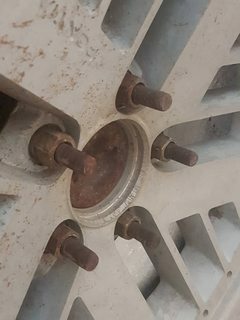 Whether the backing plate goes on first or last doesn't matter as it's the bearing retainer the bears against the seal and bearing. Now I want to go into the garage and get a picture of my assembly. If I can get to that today, I will. Do you have a picture of the end of your axle tube? No pictures right now, the end of the tube is a flush "square" flat piece. The disc brake backing plate/caliper holder has an inside diameter larger than the bearing/seal...in no way can it hold the axle into the housing alone. Therefore the bearing retainer/axle retainer plate (inboard of the Delco Moraine piece in the picture above) must be there to capture the axle/seal/bearing. There is no way around this. See the post #23 in the link below. 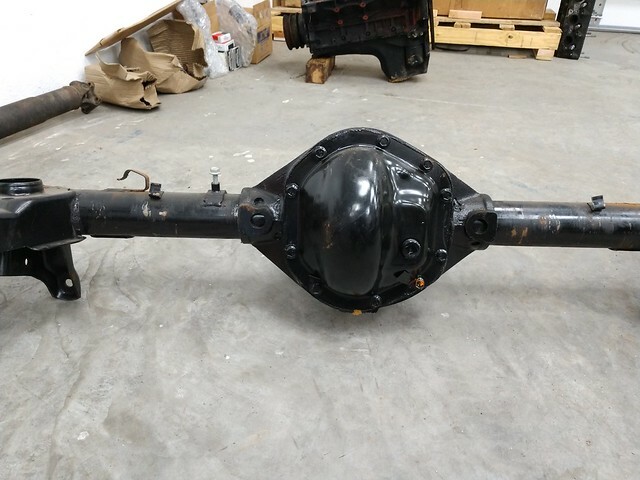 It appears there may be 2 different versions of a Dana 44 axle...one with the flush face like i have, and one with a "lip". 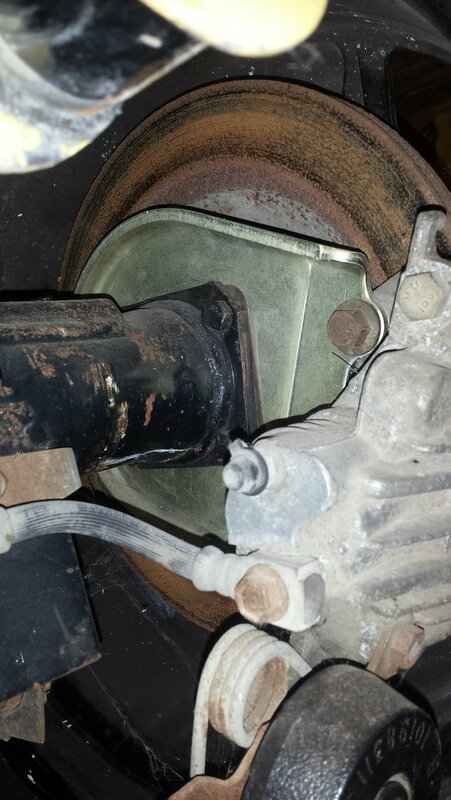 Picture 1 shows the caliper mount up around the shoulder of the axle tube. 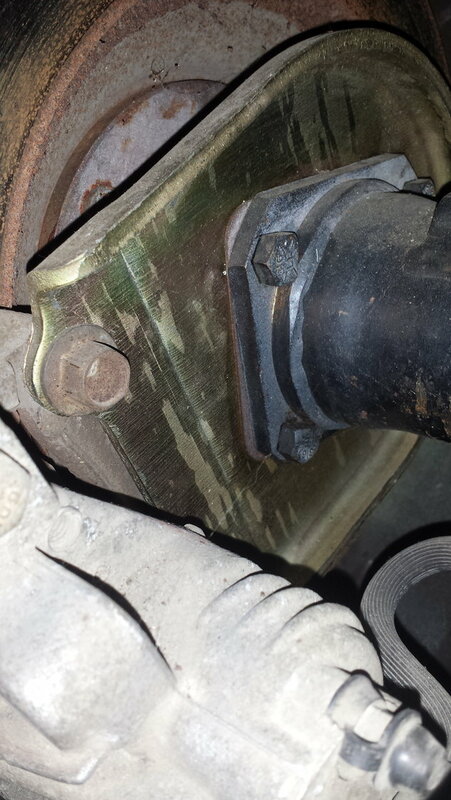 The second picture shows the retaining plate against the caliper mount. The caliper mount fits around the shoulder of the axle tube, the axle and bearing assembly fit inside the tube. I would think it would be the same for you once you get past the DM brake assembly. So here we have discovered yet another oddity in the Dana 44 world. Mine does not have a shoulder/lip, for the disc brake backing plate to slide over. ...the end of the tube is a flush "square" flat piece. 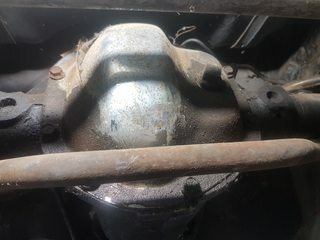 It appears there may be 2 different versions of a Dana 44 axle...one with the flush face like i have, and one with a "lip". I most certainly have a "lip" or shoulder that serves to register the caliper mount. Once the caliper mount is in place, the thickness of it is equal to the depth of the shoulder and there is now a flush surface for the bearing retainer to bear against. I have engineered drawings from Dana that shows the cross section of the axle tube end. I can only post a portion of it (at the moment) however perhaps you can determine what the arrangement of this particular drawing is. It appears to show the backing plate as you have. As I mentioned, I do not have a backing plate. Last edited by skinny z; 03-11-2018 at 06:11 PM. 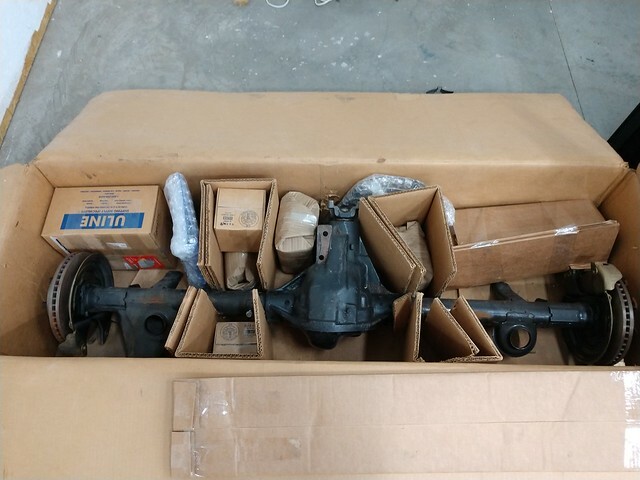 It seems that Yukon Gear has two distinct listings of the Camaro Dana 44. And that may help to explain the difference between what you have and what I have. Early years with the DM brakes and the later years with PBR. I put my dana in a factory 92 pbr caliper car. It's been awhile since it was done so I need to go look at and take a few pix. 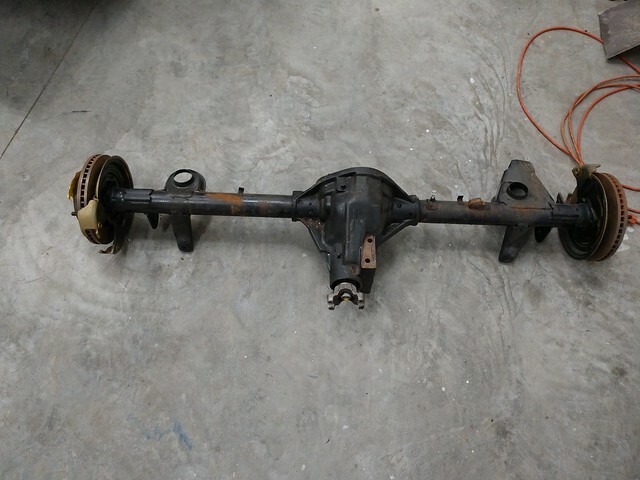 There are definitely two styles of Dana 44. 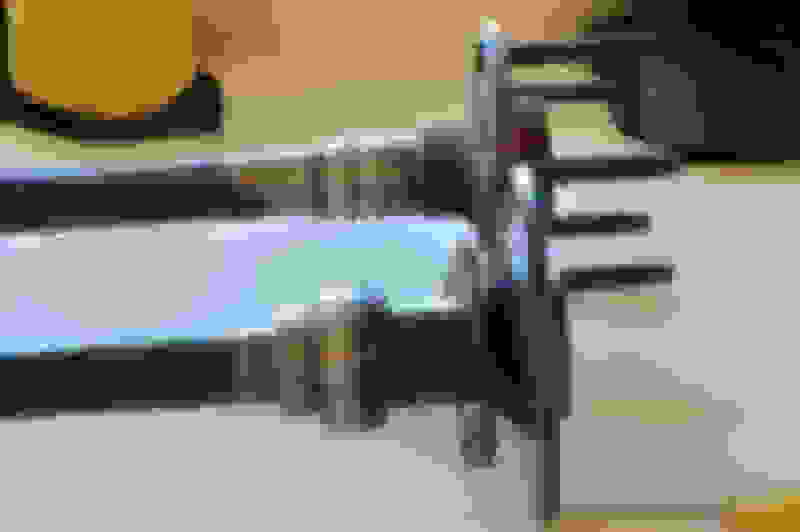 The early style, that came complete with iron calipers, and the later style to be used with Iron or PBR calipers but did not include calipers. I got mine over the counter at my local Chevy dealer and it is the early style like pictured above. I had a couple of threads discussing this back in 2005. 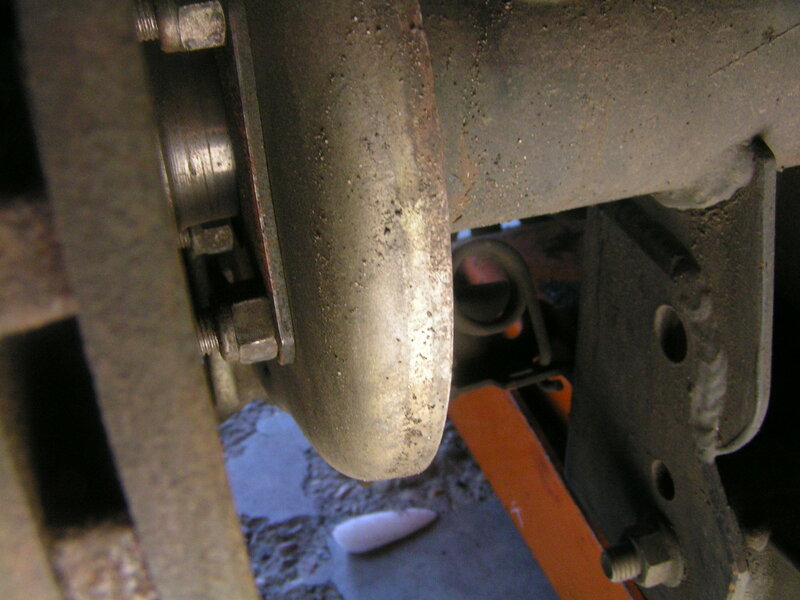 On the early style, like mine, the caliper bracket can not be removed without first pressing off the bearing. If there are are two listings for a Dana 44 in a gear catalog, I would suspect (no first hand knowledge) that it has more to do with the ratio of the gears it came with than the design of the axle tubes. 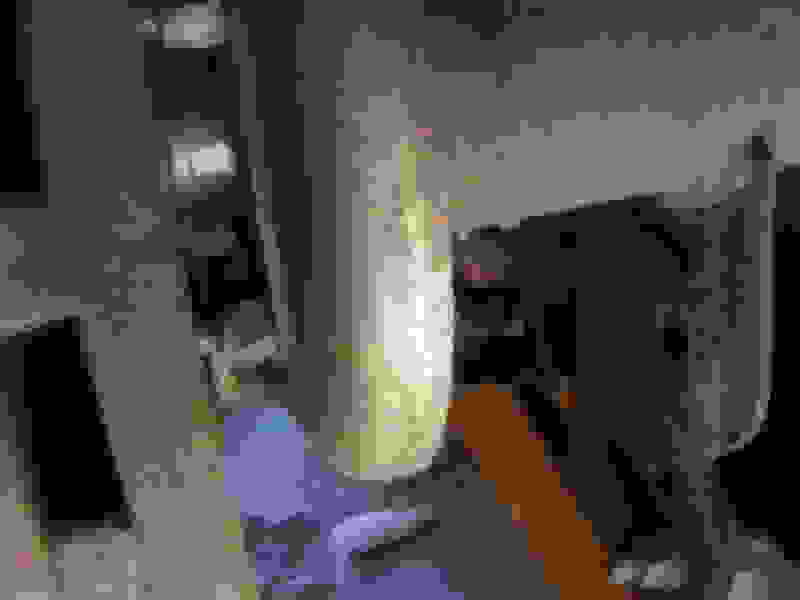 Last edited by esc; 03-11-2018 at 08:56 PM. I went out and checked my dana, axle tube, shim (factory? ), backing plate and then the bering retainer. I didn't have to remove the bearings to slide the backing plate over the bearings. (I used moded bolts so I could keep my 10bolt altogether. Not sure where the shim came from but I didn't buy them. 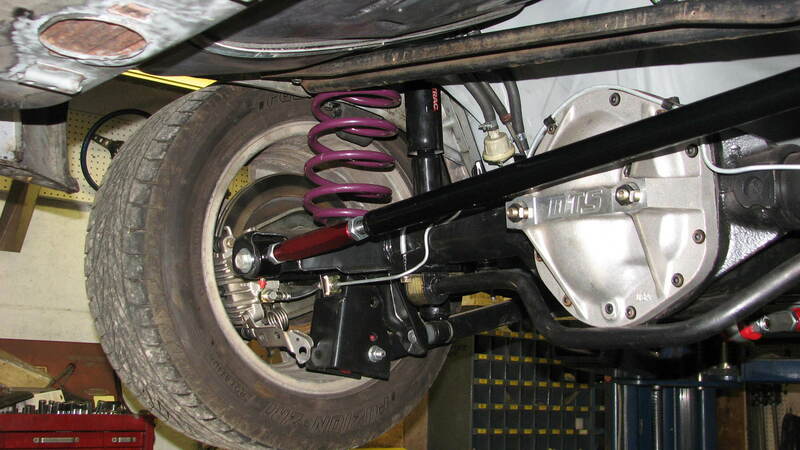 There are definitely two styles of Dana 44. I haven't gone too deep into the Yukon catalogue however that there is a distinction and that the distinction lies around the time the PBRs were introduced is interesting. In as far as I can tell, I'm the 2nd owner of this D44. 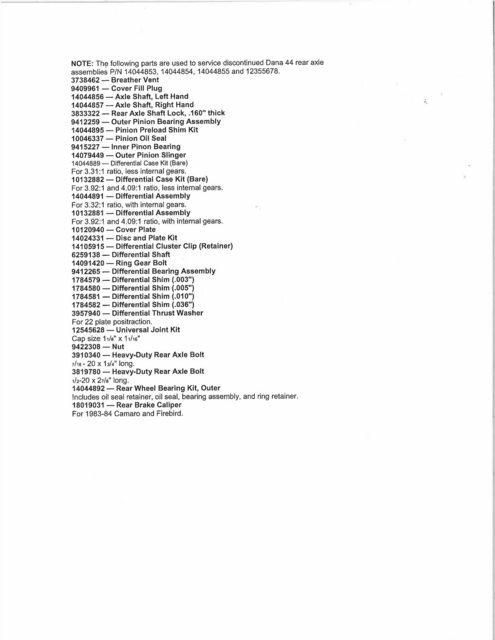 The original owner, was an employee at Dana in Indiana. He was also an SCCA racer. Those pictures ask a lot of questions. What is the shim you referring too? Is that what's sandwiched between the caliper mount and the axle flange? Is that not the bearing retainer? How does that caliper mount register on the axle tube? Is it by the 4 bolt holes or does your axle tube also have a shoulder as mine does? My factory 10 bolt had a shim on each side. You can actually see one of them in the flange picture. I see. That would be to centre the caliper over the rotor I suppose? I use individual shim washers at the caliper to achieve that. I recall that there were two different carriers, one for the 3.31:1 axles and another for 4.11:1. I don't know which the 3.96:1 was. When buying aftermarket gears, you had to get gears made for the right carrier. It's been a long time since I put it together but I may take it apart for a refresher for this post. If I remember correctly,I may have put a spacer in the backing plate to fill the empty area from bearing retainer to bearing, so the bearing retainer has something to push down on the bearing. I went to fill the axle and noticed that the stock stamped steel cover fill plug doesn't allow you to fill with enough oil to rise to the axle tube level. In fact I was only able to get the 4oz of friction modifier and just over 3/4 of a quart of gear oil in the axle. From my experiences in the past, a Dana 44 should take around 1.25-1.5 quarts. Any one else care to chime in? This really baffles me, as you can put almost 2 full quarts in a stock 10 bolt! IIRC I had room for about 1 1/2 quarts plus a small bottle of modifier. Keep in mind this is with a cast aluminium girdle style cover. Interestingly, with the cover as delivered, I was able to add almost 3 quarts. I also had fluid pushed out of the vent when the axle was warmed up. On one occasion I had the unit re-geared and the builder (a 4 x 4 specialist and Dana expert) commented that the fill hole was too high. He drilled a hole for a 1/8" NPT plug below the girdle support and the advice was to fill to that level. If I allow the initial pour of 1 1/2 quarts to settle, I found there was enough room for the friction modifier. 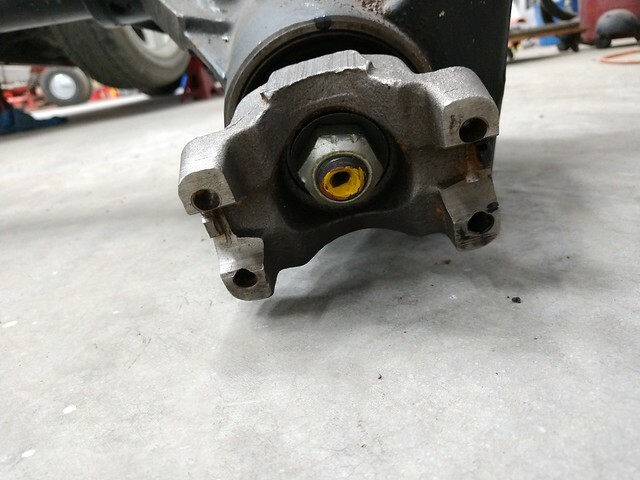 (and the order of your axle assembly is different from mine as my caliper mount is the most inboard component and the bearing retainer the furthest outboard). They were basically the same on my Dana44 vs previous production rear ends. same rear were talking about here, anyone else notice this issue? My guess would be that the studs were replaced with longer ones. Probably for use with aftermarket wheels or "low-buck" wheel spacers. well I guess I need to look and see if these are 1/2"
The thing with the D44's is that many of them ended up in race cars. Mine was purchased from a guy that was an SCCA racer. As such the rules would state that the wheel stud has to protrude past the wheel nut. Same with drag racing in certain classes. I had absurdly long wheel studs however I've since replaced them with an ARP 7708 ( 12mm x 1.5 w/ 2.5" under head length) and cut them to length to allow the use of an OEM style acorn nut. Over the counter replacements back in the day would have come with a factory length and diameter stud as esc has pointed out. Last edited by skinny z; 08-11-2018 at 03:50 PM. Studs are measured from under the "shoulder" to the end of the stud. GM had M12x1.50 wheel studs in extra length, which were stock knurl. They included some "L3" length like the above diagram, so I don't think that's what you have. Try ARP next. Not sure if they have any with oversized knurl though. on another note do other D44's have 3 sets of LCA holes in that part of the housing? one last Q: how many spline axles are these axles 28-30-31?? Looks like you have a modified D44 much like mine (in the bottom picture). In my case the 3 hole LCA relocation brackets are by Spohn. Same with the stud size. Factory was 12mm but once it's gets put into service in a race car (potentially) anything goes. Length included. As for the spline count, I'll have to look that up. I think it might be listed in this thread somewhere too. You will also find that there are two styles of retaining the axle bearing and seal. The details are posted above in a conversation with TTOP350 and myself. Last edited by skinny z; 08-15-2018 at 06:27 PM. As for the spline count, I'll have to look that up. 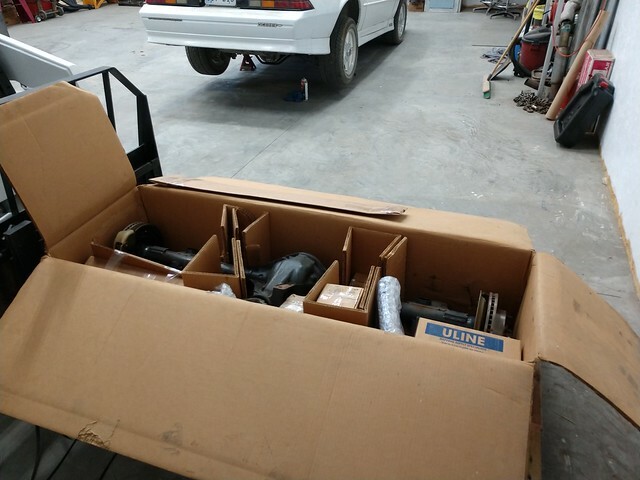 The Yukon Gear parts catalogue has one listing for the D44 as installed in a 3rd gen Camaro (84-85). There's a second listing for D44 as installed in 92-94 4th gens. Replacement axles are a 30 spline count. Yep. These D44 have no c-clips. 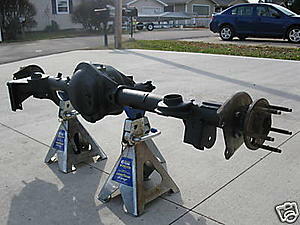 Aftermarket axles available too as are a lot of other parts. As for the mounting brackets, the extra holes are there to help with the LCA angle. As you may know already, the tuning aid is getting the front mounting point higher than the rear. When we lower these cars, those angles get messed up and the relocation holes help to bring that back to where it needs to be. In drag racing, getting the angle right will help plant the rear tires. Looks like my fuzzy eyes gave you some bad info on your other thread. As said above someone has lengthened the lower control arm mount. In the other picture It looked like someone just drilled a couple holes up. This picture clearly shows what I missed. The top hole is the factory one and the lower 2 are for more bite. My guess is that most D44s out there have been modified for racing in the nearly three decades since they were released. 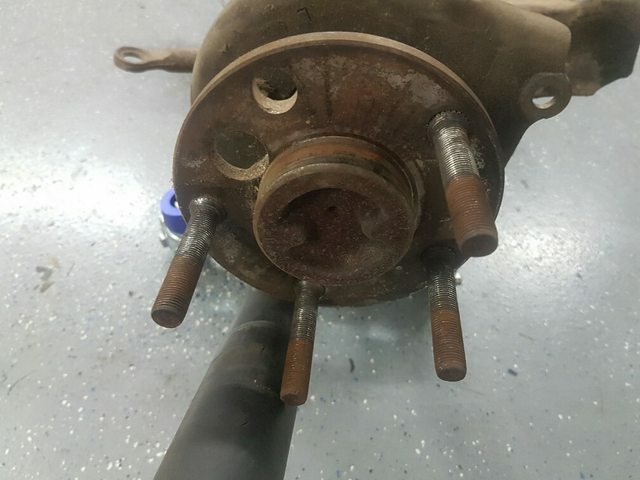 Mine didn't have the modified LCA bracket as pictured above but it did come with an adjustable panhard bar relocation bracket (which I foolishly removed) and longer wheels studs. Time for me to get serious about a rear axle upgrade. As in, I just blew mine up yesterday. I am interested in the Dana 44 option but don't see where there are any available. How many of these are out there? How hard did you have to search to find one? 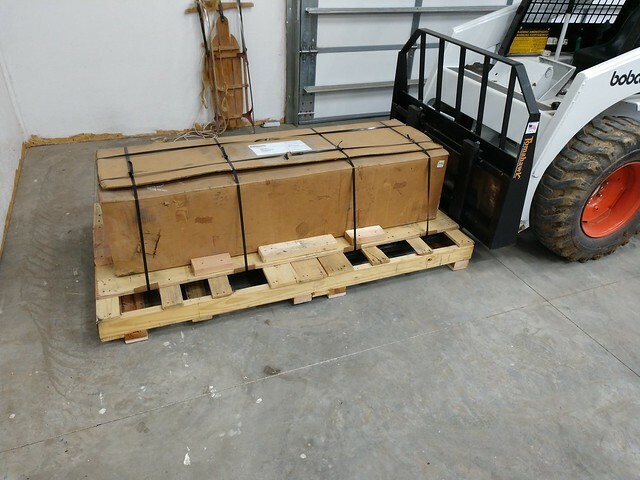 A 9" Ford lightweight fabricated, ready to bolt in, with all the lightening options(aluminum 3rd member, gun drilled axles) is $3,000 to my door. From what I'm seeing, it may cost more to put together the Dana. Any advice? I bouight mine over the parts counter in 1989. The third-gen specific Dana 44's have been out of production for a very long time, and not many (don't know exactly) were ever made to begin with. They were never a regular production part, only coming a very small number of special edition cars(TTA and FireHawk and maybe SLP come to mind). If you can find one it is a good option. But there are fewer and fewer every day. On the other hand, people are still making Ford 9's for our cars. $3000 seems kind of high, but maybe not with the lightening options. I have a vague recollection of someone selling them for about 1/2 that price. But it may have been a long time ago.